Connor Cook led the Spartans with 192 yards passing and 2 TD’s. “Revenge,” “redemption” and “heavyweight fight” were all used to describe Michigan State’s much anticipated top-10 showdown with Oregon on Saturday night. “We have lost 3 of our last 30, and we know what teams we lost to,” Spartan coach Mark Dantonio stated in an interview with mlive.com earlier in the week. The 46-27 loss a year ago to the Ducks was still very fresh in the minds of all coaches, players, and fans. But with another chance at Oregon and what Michigan State fans felt as a game they let slip away last season in Autzen Stadium, the Spartans were ready for the Ducks this time around. Saturday’s game was viewed as a building block not only for improving the Michigan State program this season, but in years to come. 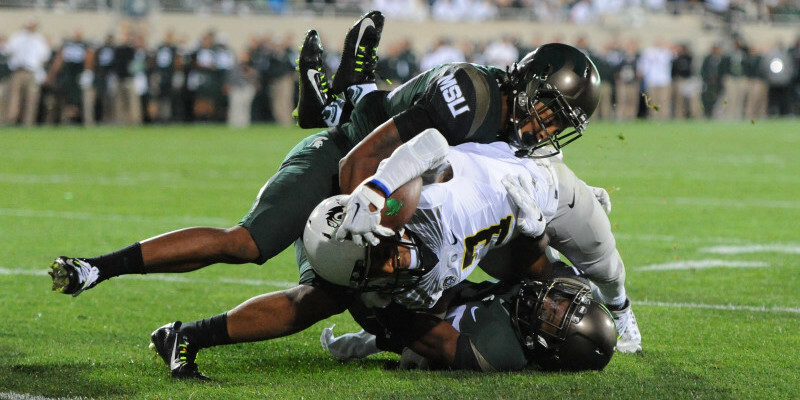 Michigan States’ defense forced two interceptions on Saturday night. “Our M.O. is to reach higher, and to do that, right now, it runs through Oregon,” Dantonio mentioned in the same interview with mlive.com. The Spartans were mentally and physically ready. They didn’t commit a penalty until the fourth quarter, two in the entire game, showing that the little things they didn’t pay attention too last season, wasn’t going to hurt them this season. With 300 recruits on hand, ESPN’s College GameDay and a sellout crowd, Spartan Stadium was the place to be on Saturday night. Michigan State used the big spotlight and platform to bolster itself among the top teams in the nation. With all of the attention going to other teams in the B1G, MSU feels as though the spotlight should be on East Lansing. Dantonio and staff followed up on that thought by inviting what is now known as “The Spartan 300.” Michigan State invited 300 recruits to attend the game on Saturday night. With the notoriety Oregon receives from their flashy uniforms and pace of play, Michigan State used that historical tie-in to its favor. The game was big, not only in the way of shaping the 2015 college football season but with Dantonio’s strategic move, Saturdays game against Oregon could shape the Michigan State football program for years to come. 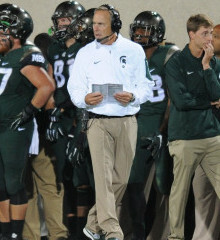 Head coach Mark Dantonio knew his players would be ready for Oregon. The Spartans have wanted this game again since the clock struck zero in Eugene a season ago. From the pre-game feel and vibe around campus to the local newspapers throughout the week, the Spartans were going to be ready. When you have the chip on your shoulder like Michigan State did on Saturday night, as well as the mental and physical preparedness, not many, if any teams were going to come into East Lansing and take away a victory from Michigan State. Even though it was only a home and home series between the two schools, both games lived up to the hype and delivered what was expected when the games were agreed upon. Games like this don’t come around often, but tonight’s game, as well as last season’s game in Autzen delivered on the hype and answered a lot of questions about each of the two programs and where they stand among college footballs elite.